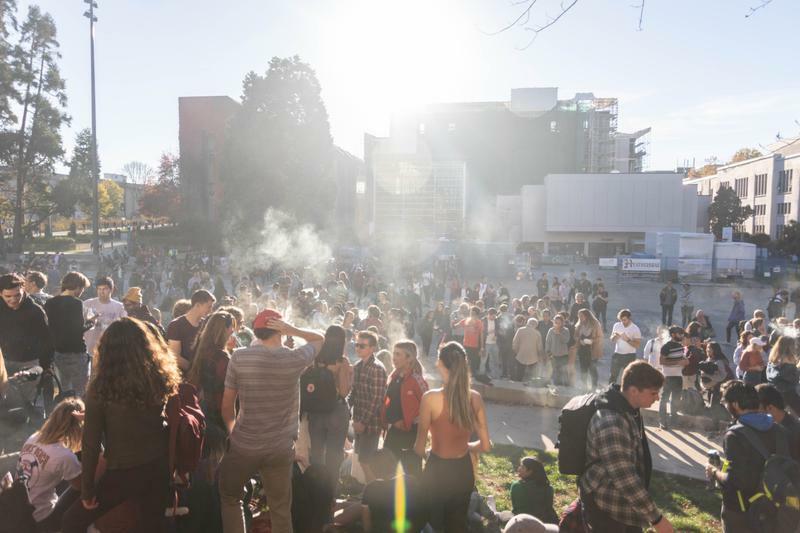 At 4:20 p.m., a massive crowd of students lit up in unison on the Knoll to celebrate the national legalization of cannabis. Organized by UBC cannabis club Hempology 101, “Legalization Celebrazion” drew a massive crowd of cannabis users and enthusiasts to advocate for social acceptance of cannabis and kick off the end of prohibition. “I have no idea how this happened,” said Natasha, one of the organizers. Students interviewed for this article asked that their last names names not be published, pointing out that although cannabis is now legal, it will take time before the personal and legal stigmas associated with its use fade away. A survey conducted by Maclean's in 2017 indicates that as many as 38 per cent of UBC students have tried cannabis. A report released by Statistics Canada this year indicates that as many as 32.7 per cent of Canadians between the ages of 15 and 24 have already used the drug. Still, advocates rejoiced that users no longer feel they have to conceal their use. UBC is one of relatively few Canadian universities adopting a liberal approach to cannabis. At most campuses, including those in provinces like Manitoba that are banning consumption of the drug in public spaces, cannabis is often banned or highly restricted. While UBC Vancouver’s policy towards cannabis won’t be finalized until February, community members can currently smoke anywhere tobacco is permitted. “I’m American and to see a whole country completely legalize cannabis, I think it’s a liberal step towards free culture and liberty,” said a second-year student. Whether it was what was being passed around or the sun, most felt that legalization was off to a good start. “People worried about being arrested … now that it’s legalized and people know that nothing can happen, they can just be out here,” said Natasha.